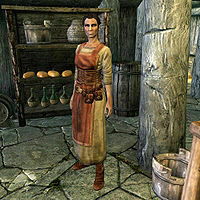 Iddra is a Nord citizen and an innkeeper at the Braidwood Inn in the town of Kynesgrove. She manages the inn, providing room rentals as well as merchant services, and from 8am to 8pm she stands behind the inn's counter to work. Her husband, Kjeld, takes over renting the inn's rooms if she dies. She and Kjeld also have a son, Kjeld the Younger, and a younger daughter, Froa, although she is only mentioned in conversations. She may ask you to talk with one of her customers, Roggi Knot-Beard, about his tab. Iddra wears a set of merchant clothes and a pair of boots. She is equipped with an iron dagger, and carries a selection of common items and gold. When approached, she can be found telling you, "I hope you'll stay for a bit. We could certainly use the business. ", "This is really quite a nice town when you get down to it. Just look at the view! ", or "Got some nice comfy beds at the Braidwood Inn, if you're looking to flop down somewhere." She may also talk about Roggi: "Poor Roggi. If you're feeling charitable, buy the Nord a mead. He's good for it." She may apologize to you about her husband Kjeld: "Did you see my husband already? I'm sorry... he can come off a bit rough at times." Asking her who Roggi is will have her reply, "He's been in Kynesgrove forever. Great storyteller. Keeps everyone's spirits up." She'll continue by explaining the situation with him: "Owes me a lot of coin for drinks. I keep telling him not to worry about it, but he's got the stubborn Nord blood. Damn fool doesn't have the coin to pay me back, so he just beats himself up over it, and then he gets thirsty, and it cycles all over again." If you offer to talk to him, Iddra will say, "If you could convince him that I don't care about his tab, it'd certainly make me feel better." If you instead say that you're sorry to hear that, she'll reply, "He'll be fine, I just hate worrying about his worrying." Once you've successfully persuaded Roggi, mention to her that he won't be complaining anymore and she'll be grateful to you: "It'll be good to not have to hear him whining about his debts. Roggi pawned a few of his things back when he still had things to pawn. Take them." She will reward you with one unenchanted weapon and piece of armor. Should you ask her where you can learn more about magic, she will be disapproving of it, but will be helpful nevertheless: "Magic is nothing but trouble. If you're set on it, there's that College in Winterhold or Ulfric's court wizard. But don't say I didn't warn you." Roggi: "How are the little ones?" Iddra: "Oh, you know. Little Kjeld is a handful, and Froa is just so quiet." Roggi: "He takes after his father, and she takes after you." Iddra: "Well, that's the good and the bad of it." Iddra: "If you like mead so much, why not go live in Riften?" Roggi: "Oh, I wouldn't be able to help them. Their skills were given by the Divines." Iddra: "Maybe you could be a taster or something." Roggi: "Ah, but I can do that right here. Right now!" Roggi: "Have you heard about Goldenglow Meadery?" Iddra: "Did something happen to it?" Roggi: "All the apiaries... it will take years to get those bees happy again." Iddra: "Do the bees need to be happy?" Roggi: "Of course! You can't make good mead without happy honey!" Iddra: "I'm going to need your help in the kitchen tomorrow." Kjeld the Younger: "But papa was going to take me hunting tomorrow!" Iddra: "Oh, I don't think you're old enough for that yet. You can help me salt the cheese curd." Kjeld the Younger: "Why can't Froa do it?" Iddra: "Because I'm telling you to." Iddra: "You need to take better care of your sister." Kjeld the Younger: "But she's so stupid!" Iddra: "She said you threw her into a goat pen yesterday." Kjeld the Younger: "Because she was being stupid!" Iddra: "Don't make me bring your father into this." Kjeld the Younger: "Mama, when can we go play in the river again?" Iddra: "Not with all those soldiers all over the hold. Their horses can't see you, you know." Kjeld the Younger: "I know, but..."
Iddra: "And you'll be trampled to death!" Kjeld the Younger: "No way. I'm quick!" Iddra: "Well why don't you be quick about finding my book that you lost?" This page was last modified on 5 February 2014, at 16:47.